Spot marine species such as pink and gray dolphins, sting rays, manatees and crabs at the conluence of Rivers. 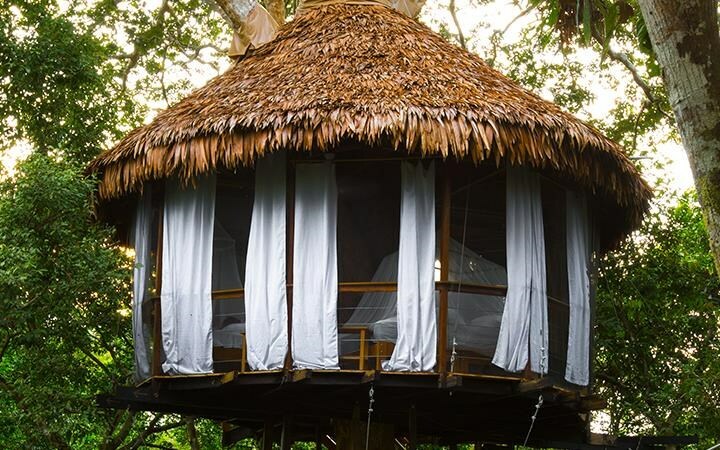 A total of 10 types of treehouse for you to choose from! *3, 4 and 6 day tours are also available. This excursion is a guest favorite. We will often recommend that you enjoy this excursions on the day of your arrival at Treehouse Lodge. It’s the perfect kick-off to an incredible time in the Peruvian Amazon. Just before dusk you will boat along the Yarapa and Ucayali rivers until you reach the Amazon proper. The world famous Pink and Gray river dolphins will start to appear near your boat while the sunset gives the perfect backdrop. Take a moment to breath the freshest air on the planet. Listen to the sounds of the Amazon as you start to welcome nightfall. Just after sunset you will head back to the Lodge and prepare for an evening and night of Amazonian adventures. You’ve traveled across the planet to see the world’s greatest river: the mighty Amazon. This is your opportunity to knock out a bucket list item by going for a swim. You will travel down the tributaries to the main Amazon river with your private guide and navigator. Take as little or as long as you want to enjoy a refreshing dip. If you’re lucky a dolphin or two might appear. When you’re done enjoying a swim you will travel back towards Treehouse Lodge while observing any interesting flora and fauna along the way. For centuries, River people have moved along the Amazonian rivers on dugout canoes. Even today, this mode of transportation is the best way to explore the creeks: navigating slow, listening to the sounds of the jungle, and observing nature, attempting to imitate the exact way ribereño people see the forest. If you are a bird watcher from the canoes, you can observe and take pictures of many species of birds that feed and make nests close to the river shores. Many species of primates such as brown capuchins, squirrel monkeys, and saddle backed tamarins are easy to spot. You may even be able to observe rare and elusive creatures such as the river otters from the dugout canoes. One of our most popular excursions, this will be one of the great adventures you have while visiting Treehouse Lodge. Travel by boat to one of the many great piranha fishing spots in the area. Armed with a wooden pole, string, hook, and meat, you will lower the bait into the water. When the piranhas strike (and they will! ), simply life up the pole. Don’t worry, we will retrieve the fish for you. We have yet to have a guest that hasn’t succeeded. Once you’re done you can choose to catch-and-release, or, if you prefer, the chefs at Treehouse Lodge will prepare the piranha as a side dish to your nightly meal. The natives of the Amazon rain forest have relied on blowgun hunting for hundreds of years. Known in Peru as pucuna, blowguns can be used by skilled hunters to hit animals from a distance of 60-90 feet. During this excursion you will be mentored by a local villager on how to make your own blowgun. Take your time to craft your perfect blowgun and then feel free to practice throughout your stay and on your excursions. The rainforest is like a green pharmacy where you can find many plants used to treat different diseases. You can find forest medicines for headaches, stomachaches, broken bones, hernias, and rheumatism – even for diabetes. On this Amazon Jungle excursion, you will explore through this greenery in search for some medicines found in each plant or tree, learning the secrets of the jungle and the relationship between plant and man; all the while bringing you closer to Mother Nature, protector of all the living organisms on our planet earth. Join this jungle walk to witness the only nocturnal monkey that can be spotted during the daytime. These primates make their homes in tree holes and, once located, can be seen sticking their heads out to take a peek. You will walk along a trail that runs close to an old tree where these night monkeys can be seen. They have a good sense of hearing, are very curious, and apparently evolved into nocturnal animals in order to avoid competition over food. On this walk there is also a chance that you can spot any of the following species of monkeys: owl monkey, pigmy marmoset, monk saki, squirrel, red howler, duski titi, wooly monkey, and tamarins. Embark on an adventurous boat ride through the tributaries of the Amazon. You will see abundant wildlife and nature in all of its glory while we search for the Amazon River’s specialties such as Blue and Yellow Macaws, Wattled Jacanas, Trogons, Black Collared Hawk, Oropendolas, Yellow-Headed Cara Cara, and Tanagers, among others. Your guide will also help you spot sloths and monkeys in the trees above you as you cruise around the Yarapa and Cumaceba rivers. If you enjoy the river by day, just imagine the life that awakens at night. On our night excursion, you will travel along the river, looking for wildlife with flashlights. The chances of spotting wildlife are good. You will see creatures like beautifully colored frogs resting on the floating plants on the edges of the creeks. You will see fishing bats that catch their prey using their talons like hawks, detected by sophisticated sonar. By the light of your flashlight, you will see potoos, owls, and caimans (located through their red eyes) that venture through the dark to catch their prey. Depart Treehouse on a motorized canoe along the Yarapa and Cumaceba rivers. The mysterious sounds of the jungle will be a highlight throughout the excursion. Caimans are close relatives of the alligator that can be found throughout the Amazon rain forest. Like their crocodilian cousins, Caimans live near rivers and other bodies of water. Most caimans are around six or seven feet long, but the largest species, the black Caiman, can grow to a length of 15 feet. After the thrill of this incredible hunt in the dark you will transfer back to Treehouse Lodge. Night time is a prime time for feeding. Once the sun sets, many creatures come out, some are the predators and others the prey. On this night excursion, you will see exotic beetles (rhinoceros and elephant species) and moths (sphinx and roschildia species). You will also find some lizards sleeping on the leaves. On our walk, you can see diverse species of frogs like the famous owl frog that makes holes in the ground and weighs over ½ pound. Amazonian people use the skin of this interesting anuran to make drums, but the owl frog protects itself from its predator by releasing a milky liquid from its skin. Treehouse Lodge is one of the most unique hotels in the world. 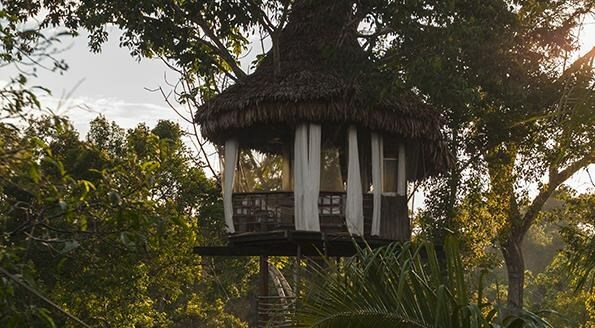 Featured by National Geographic as one of the Top 10 Most Unusual Hotels in the World, Treehouse offers the incomparable experience of observing the Amazon rain forest from the treetop canopies. On this excursion you will explore all of the canopy walkways and viewing platforms that dot the are of the Lodge. Learn about the history and architecture of the lodge while you observe wildlife from 30 – 70 feet above the jungle floor. The best way to witness wildlife is by waking up early to the sound of hundreds of birds and monkeys. The suspension bridges are built to bring you closer to all the wildlife that exists around Treehouse Lodge. You will see many species of tanagers, toucans, parrots, parakeets, antbirds, antwrens, woodpeckers, and monkeys that come to feed on the fruit and insects found on the trees. There are species of birds that never venture closer to the ground because the fruit they eat is found on the tree tops. Being closer to the canopy, it’s easy to see the beauty of these species. In only one early morning, you will observe at least 50 species of birds, 20 of which are uncommon. The Amazon rain forest has no distracting city lights and the sky is wide open. A popular excursion for astronomy buffs, It is breathtaking to stare upwards at millions and millions of twinkling stars. Enjoy the serenity of cruising the tributaries of the Amazon as you try to find the Southern Cross. As you can imagine, this excursion is weather pending. Coordinate with your private guide for when a good night would be for this activity. Due to conflicts and tribal disputes that happened many years ago, a group of Jibaro people decided to move from their ancestral land located on the Pastaza river to an area closer to the equatorial border. They navigated downstream, following the Marañon river, then travelled along the Amazon to finally arrive at the Tahuayo river – a small, blackwater tributary where they created their community anew in peace, away from other villages, preserving their traditions and the knowledge of the ethnolinguistic group. You will take a boat from Treehouse Lodge downstream on the Yarapa River for 30 minutes to reach a community called Jaldar. From this village, you will walk 40 minutes on a jungle trail to arrive at the Jerusalem Jibaro community on the Tahuayo River. Spend your time learning about their culture, lifestyle and craft-making skills. If you’re looking for a way to truly experience the Peruvian natives, this is it. Visit Puerto Miguel and interact with the river people who still preserve their traditions, ancient knowledge, and even language. We will get to explore their homes made out of wood and palm trees to see how they live, what they cook, and the way they survive using the natural resources of the rainforest. This is your chance to captain your own boat and see wildlife from a river perspective. Exploring the river by kayak you are able to explore the rivers and creeks without the noise of a boat engine. This creates a peaceful atmosphere and an ideal situation for capturing wildlife. You might see beautiful birds, monkeys and river otters. 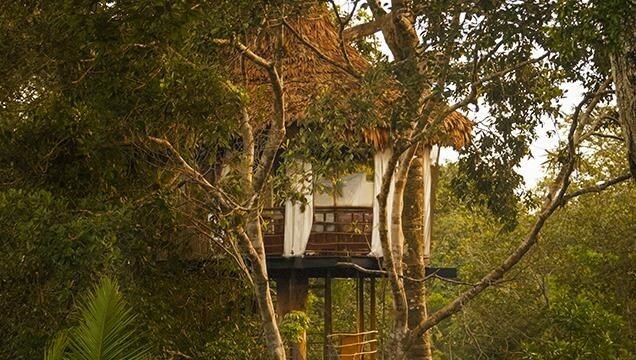 This unique accommodation experience offers 10 treehouse cabins located in the heart of the Amazon Rainforest. Requests can be made for guests staying with up to 5 people. 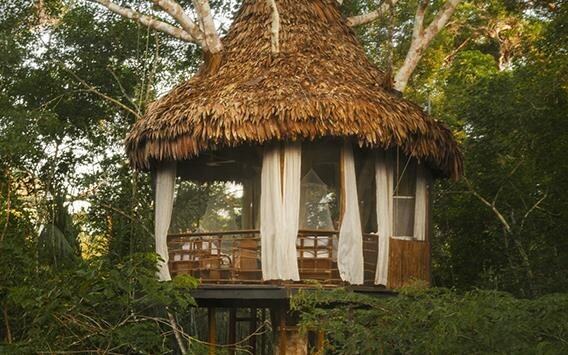 Each treehouse is located and built differently to tailor to the preferences of guests. *All excursions last from 2 to 3 hours depending to the water level and the weather conditions.